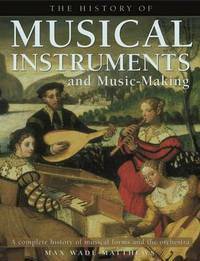 This book poses the questions What is music?A" and What is a musical instrument?A" Each of the principal ancient civilizations is investigated, with information about key developments and traditions. The text focuses on methods of music-making, explaining how the string and bow create sound, the tonal quality of single and double reeds, the impact of the development of valves, the variety of drum skins, and the types of keyboard mechanisms. The book also covers the most famous musicians, the role of the composer and the conductor, and the best-known orchestras and concert halls around the world. It not only charts the history of the orchestra but also looks at the history of all the major musical movements and forms, including folk music, brass and military bands, country music, jazz, big bands and popular music. Max Wade-Matthews attended the RAF School of Music at Uxbridge and served in brass bands in England, Germany and Hong Kong. After leaving the RAF he formed a living-history brass band. He has written several books about the history of Leicester, England, including Musical Leicester, a history of musical life in that city, as well as playing with brass bands, conducting and teaching.